Rates: Rates are subject to change without notice. All rates, except for Double Tent Sites, include two (2) people per site and one (1) vehicle. Each additional person is subject to an additional fee of $5 per day. 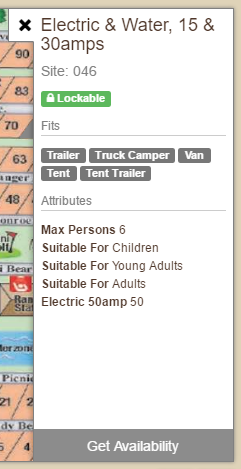 Maximum of six (6) people per site, except for Double Tent Sites. Payment Policy: Full payment is required at the time of booking fee and is payable by credit card. By providing a credit card number, you are giving authorization for us to bill your credit card for the full amount, including any costs accrued while at the property, and outstanding balances not paid at time of departure. Cancellation Policy: Cancellations made prior to 10 days before the arrival date are subject to a cancellation fee of $25.00. Cancellations made within 10 days of the scheduled check-in are subject to a one night reservation charge. Refund Policy: No refunds will be given for early departures or for inclement weather. Pets: Please note – no pets are permitted in the cabins or the tent site areas. Pet rules must be followed and apply to all pet types. 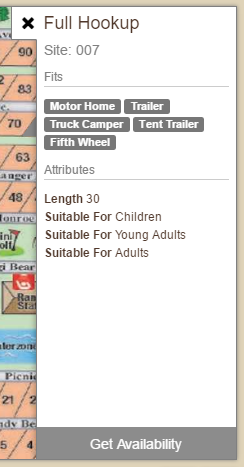 Maximum of three (3) pets per RV site.